Patch contributed by Harold F. (Carl) Carlson & submitted by Gary Carlson. 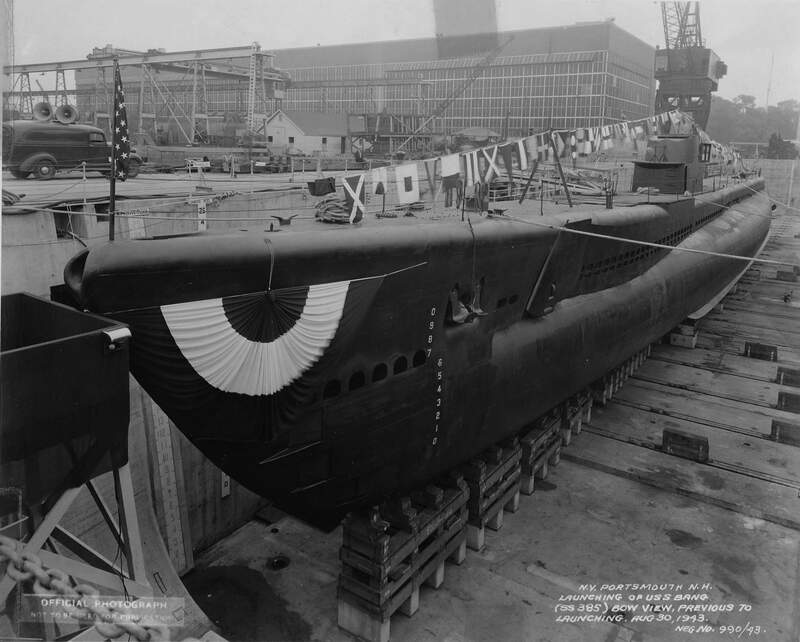 Balao Class Submarine: Laid down, 18 August 1942, at Portsmouth Navy Yard, Kittery, ME; Launched, 24 December 1942; Commissioned USS Cabrilla (SS-288), 24 May 1943; Decommissioned, 7 August 1946, at the Naval Submarine Base, New London, CT.; Laid up in the Atlantic Reserve Fleet, New London Group; Recommissioned, (date unknown); Redesignated Auxiliary Submarine (AGSS-288), in 1962; Decommissioned, 30 June 1968 and simultaneously struck from the Naval Register. 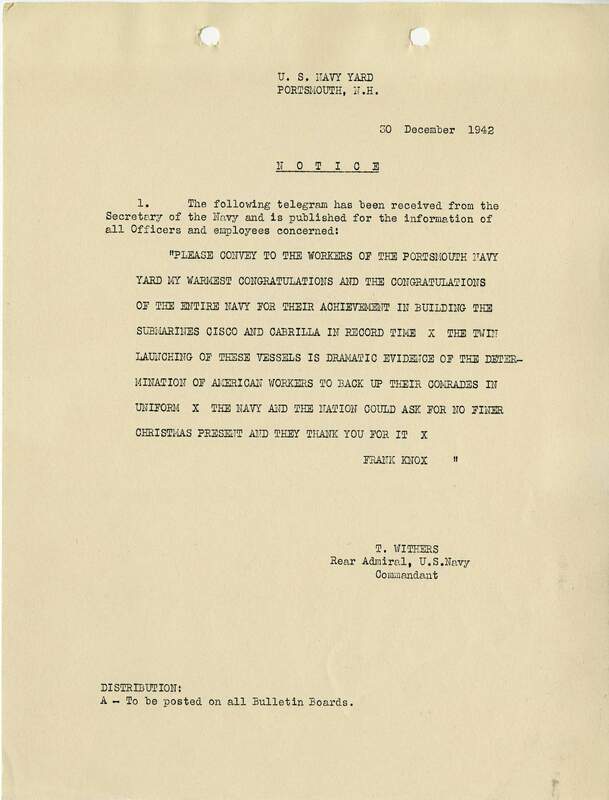 Trans to Subvets WWII Houston, TX 19 October 1968. Returned 21 October 1971. Sold 18 April 1972 to Southern Scrap Mat'l. Co., New Orleans, LA for $ 52,889.00. 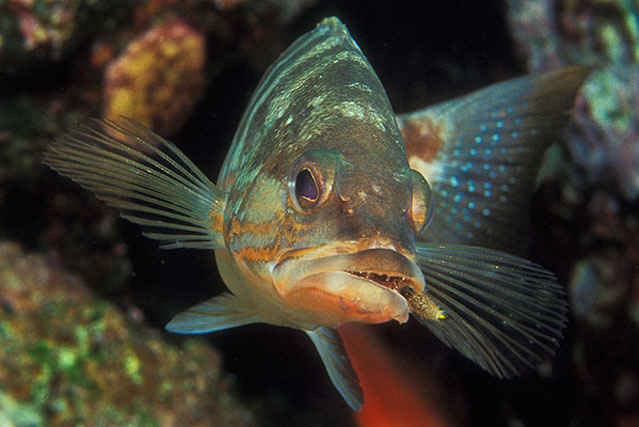 Cabrilla earned six battle stars for her World War II service. Specifications: Displacement, Surfaced: 1,526 t., Submerged: 2,414 t.; Length 311' 9"; Beam 27' 3"; Draft 15' 3"; Speed, Surfaced 20.25 kts, Submerged 8.75 kts; Cruising Range, 11,000 miles surfaced at 10kts; Submerged Endurance, 48 hours at 2kts; Operating Depth Limit, 400 ft; Complement 6 Officers 60 Enlisted; Armament, ten 21" torpedo tubes, six forward, four aft, 24 torpedoes, one 4"/50 deck gun, one 40mm gun, two .50 cal. machine guns; Patrol Endurance 75 days; Propulsion, diesel-electric reduction gear with four General Motors main generator diesel engines, 5,400 hp, Fuel Capacity 94,400 gal., four General Electric main motors with 2,740 hp, two 126-cell main storage batteries, two propellers. 28k Cabrilla Serranus cabrilla Photo courtesy of Borut Furlan / fishbase.org. NR Two Subs Will Be Launched On Christmas Eve: Portsmouth Navy Yard's Christmas gift to the Nation will be the submarines Cisco (SS-290) and Cabrilla (SS-288) to be launched tomorrow weeks ahead of schedule. Rear Admiral Thomas Withers, commandant of the yard, announced today. Image and text provided by Library of Congress, Washington, DC. Photo by Evening Star. [volume] (Washington, D.C.) 1854-1972, 23 December 1942, Image 1, courtesy of chroniclingamerica.loc.gov. 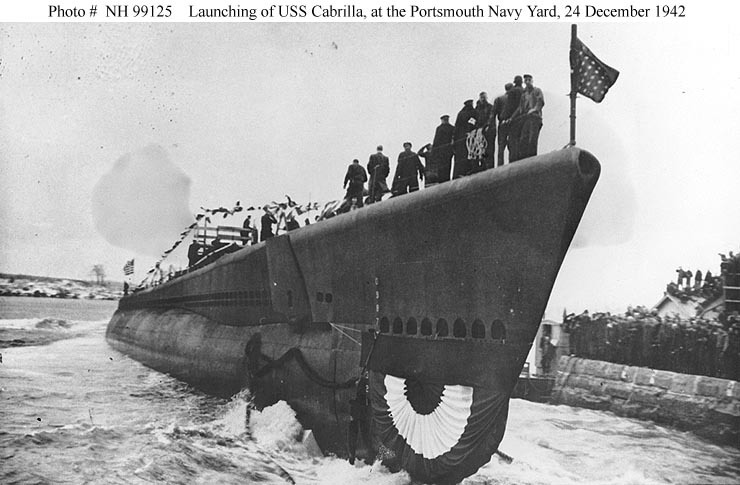 70k Launching of the Cabrilla (SS-288) at the Portsmouth Navy Yard, Kittery, Maine, 24 December 1942. USNHC photo # NH 99125, courtesy of Donald M. McPherson, 1975. 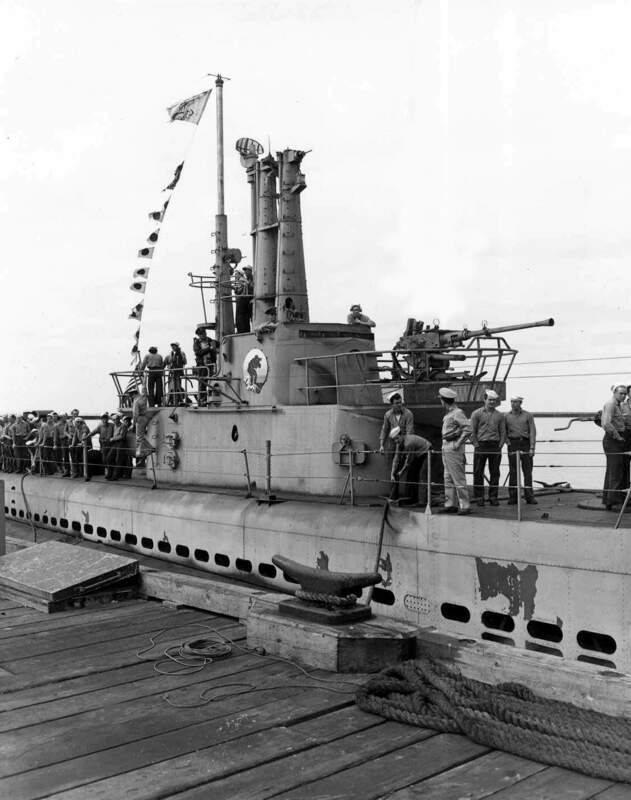 255k Cabrilla (SS-288) crew photo durring commissioning on 24 May 1943. Commander D. T. Hammond is in the middle. Photo courtesy of huntingpictures.net. 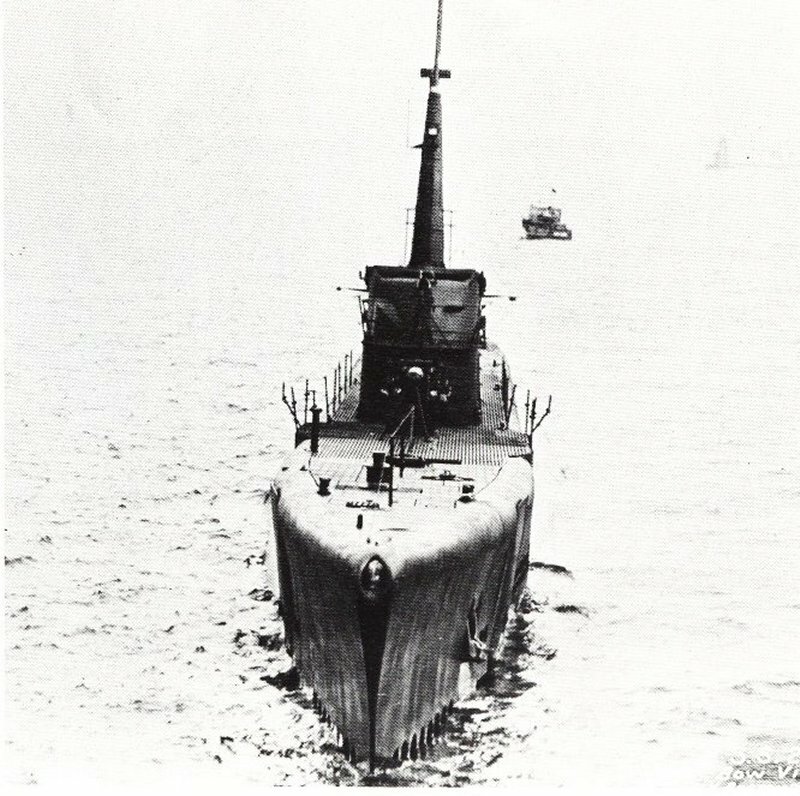 76k Bow view of the Cabrilla (SS-288) taken on June 1943 on sea trials. U.S. Navy photo. 112k Bows on view of the Cabrilla (SS-288), taken on June 1943 on sea trials. The hole in the bow is called the "bull-nose" and is used for mooring the ship for towing. Like other Portsmouth designed boats, the anchor is on the port side. The bulge in the left side of the bridge is for clearance of the access hatch for the bridge. USN Archives photo # 19-N-48984. 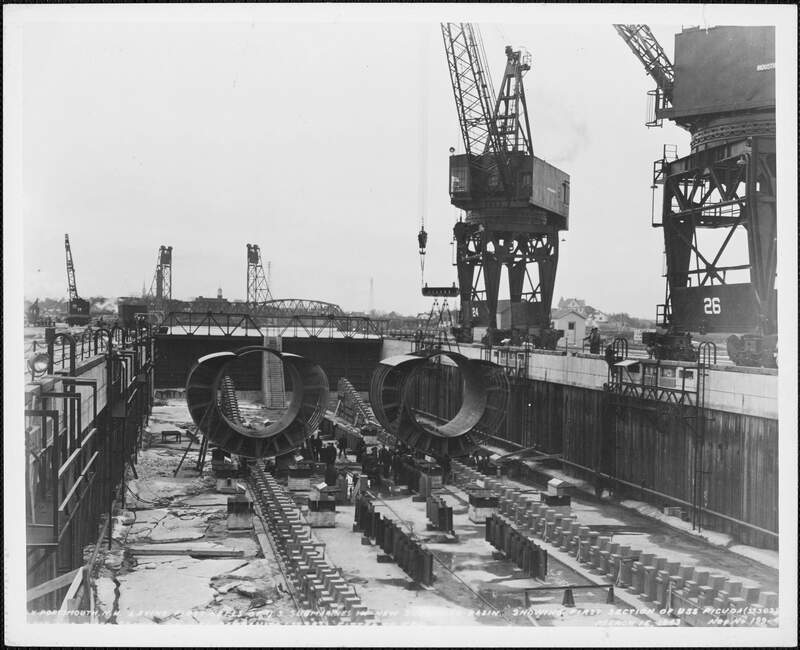 Photo and text courtesy of The Floating Drydock, "Fleet Subs of WW II" by Thomas F. Walkowiak. 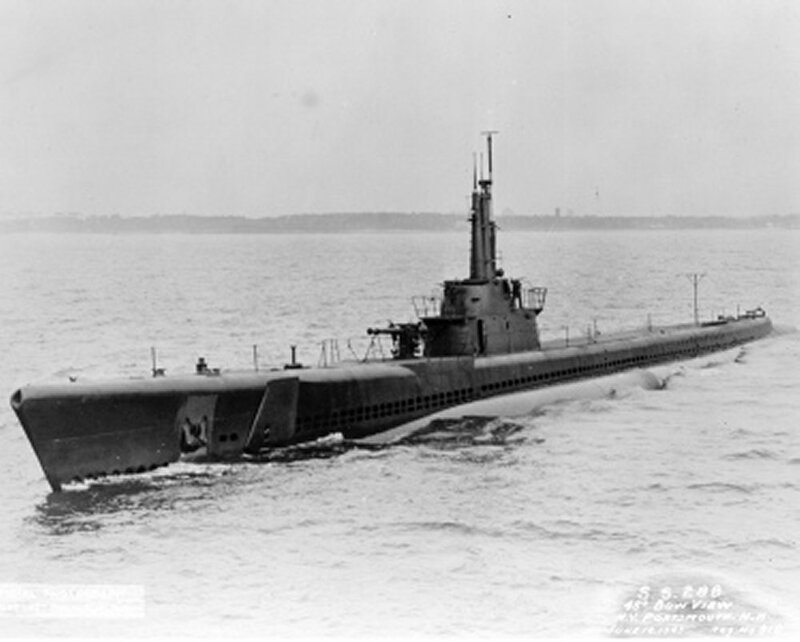 She breaks into three after being torpedoed by Cabrilla (SS-288), on 6 October 1944. Photo & text i.d. from combinedfleet.com & United States Submarine Operations in World War II, by Theodore Roscoe, courtesy of Robert Hurst. 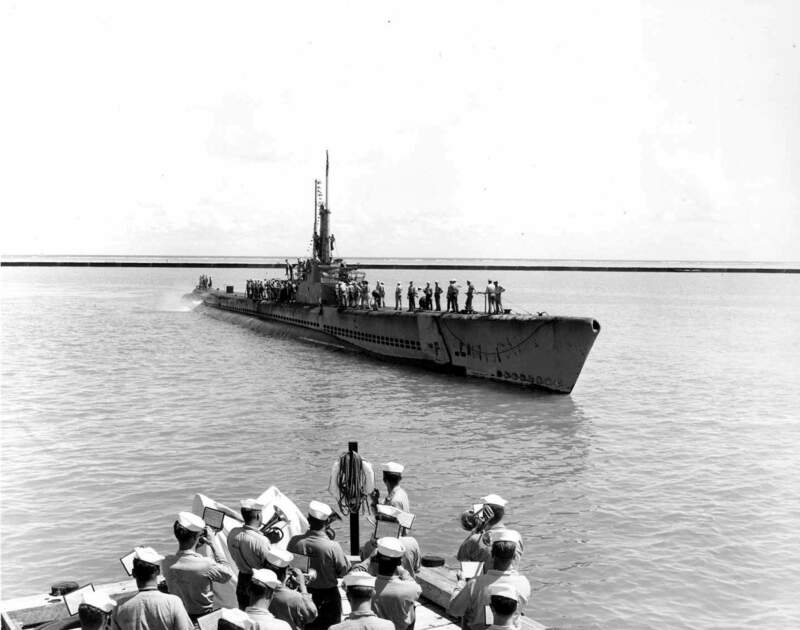 142k A band welcomes the Cabrilla (SS-288) back from her patrol. U.S. Navy photo, courtesy of ussubvetsofworldwarii. 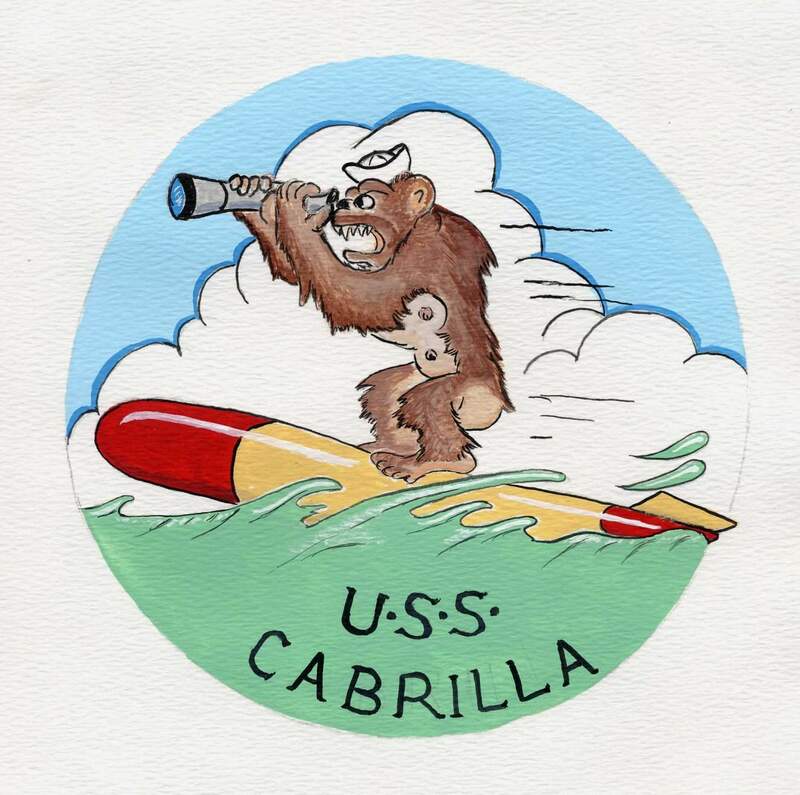 143k Cabrilla (SS-288) returning from patrol. U.S. Navy photo, courtesy of ussubvetsofworldwarii. 110k A front view of the front 40mm gun aboard an unknown sub, possibly the Cabrilla (SS-288). These guns proved to be very effective against small surface targets and aircraft. Some boats had these guns mounted either forward and / or aft on the bridge gun deck. 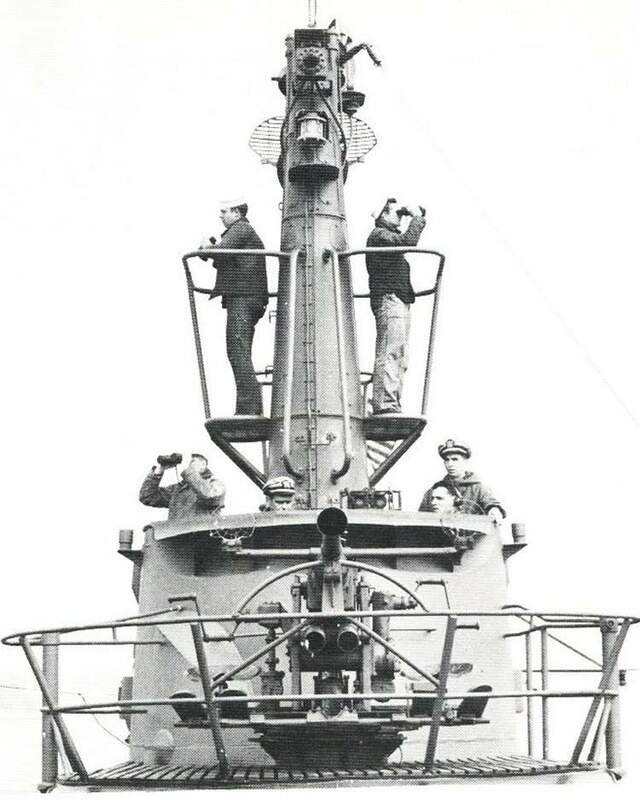 Details of the shears show the arrangement of the lookout platforms and the range light and the PPI antenna. Both scopes are lowered. USN Archives photo # USN-434018. 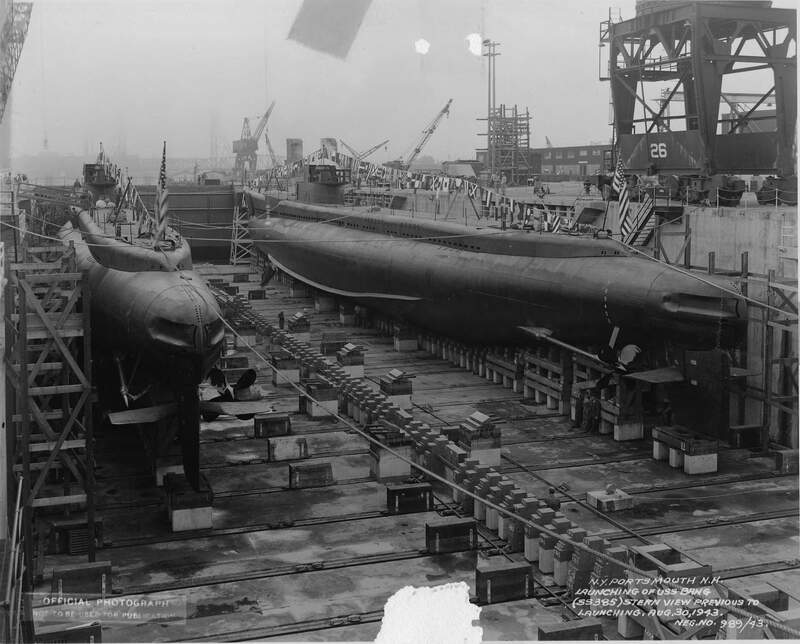 Photo and text courtesy of The Floating Drydock, "Fleet Subs of WW II" by Thomas F. Walkowiak. 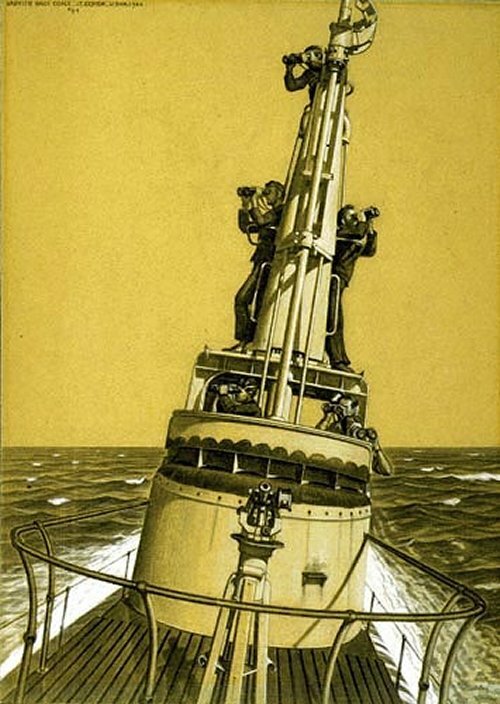 112k What could be the Cabrilla (SS-288) on her patrol off Christmas Island, January-March 1944, in a charcoal drawing by the artist Griffith Baily Coale entitled "Lookouts--U.S. Submarine". "Rolling along the blue surface of the Indian Ocean, lookouts search the empty sky and the sea. They look for everyone, friend or foe. 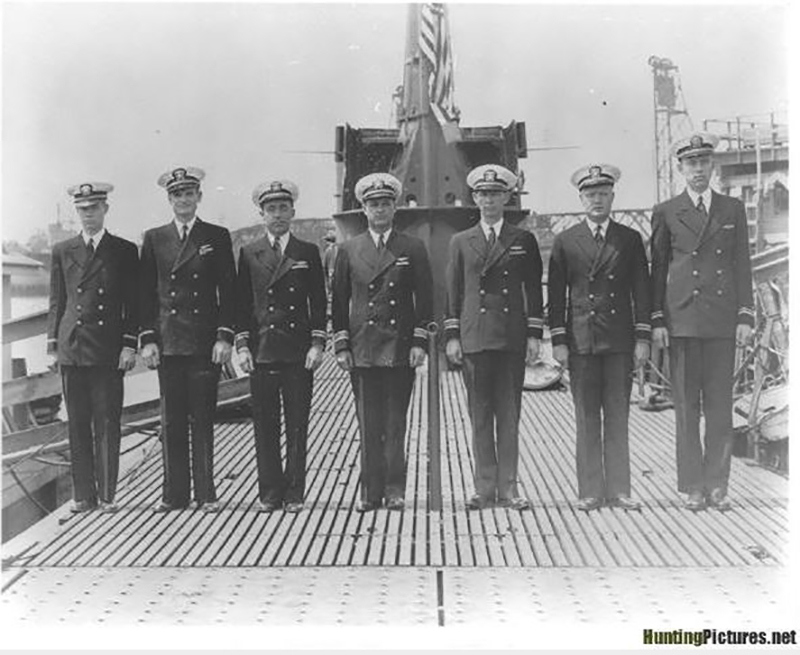 Besides these five men, just aft was the Junior Officer and his lookout, also watching. The man at the top of the periscope shears spotted a distant sub on the surface. There was no record of one of our boats in this vicinity. 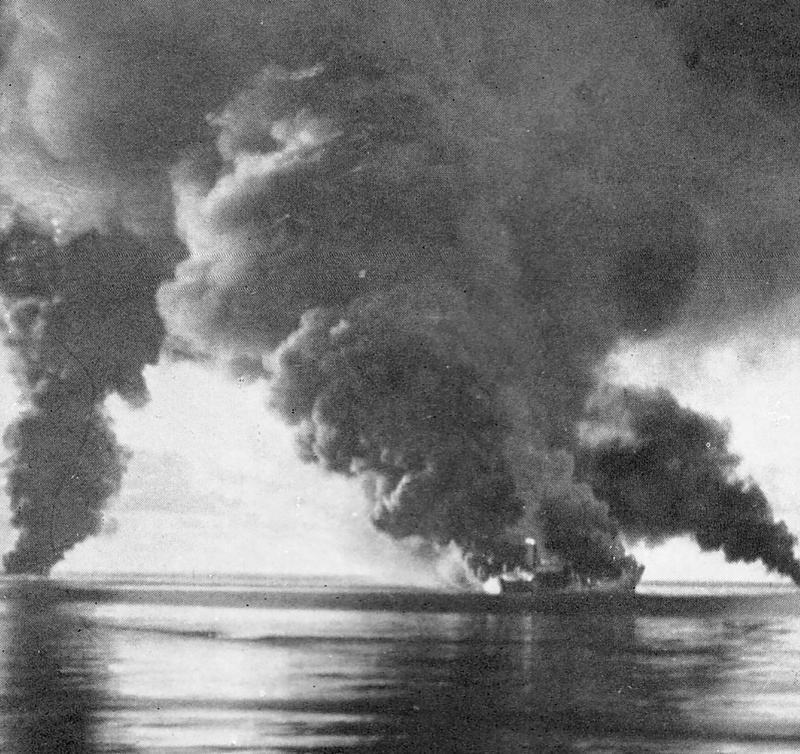 In ten seconds every man is below, the hatch bangs shut, the deck tips forward and they disappear below the vast surface of the ocean. Later they rise to pericope height, the Captain makes a sweep. "Blow the tanks- equalize the pressure - crack the hatch - Lookouts up!" In ten seconds the lookouts are back on deck searching." 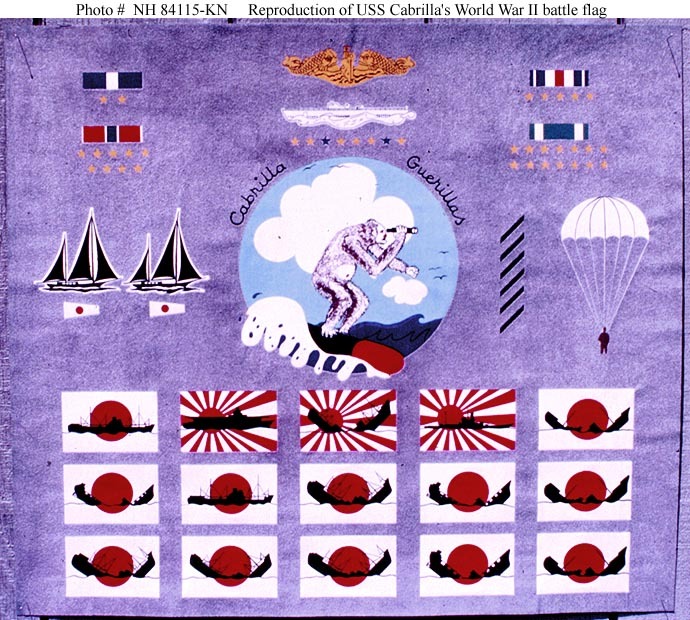 146k Reproduction of the Cabrilla's (SS-288) World War II battle flag, made by the Carleton Company. USNHC photo # NH 84115-KN, Donation of Hubert Scheffy, 1976.